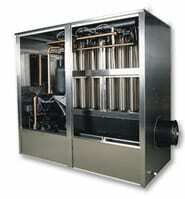 We are the leading manufacturer of vertical tube industrial ice machines that embody performance at its best. Our machines are made to be reliable, easy to maintain, and energy and water efficient. Every Arctic -Temp model is built to the highest standard, so you can rest assured you’ve made the right choice. Why Choose Our Arctic-Temp Indutrial Ice Makers? Commercial ice machines differ, so what makes Arctic-Temp so good? There are a number of reasons that our machines are your best choice. Here are several of them. Our machines are hand assembled and TIG welded. The low side of our machines is manufactured first and then perfectly matched with the compressor side. The ice-making low side of the machine is manufactured using non-magnetic stainless steel that’s a very high grade, unlike some of our competitors. Each machine we produce is thoroughly tested for leaks and it is vacuum tested. It is then calibrated and tested again after it’s charged with refrigerant to assure you receive a trouble-free machine. We use very high quality Copeland compressors, that are renowned as the industry’s best. Extraordinary Value – Our combination of price, efficiency, reliability, and ease of maintenance, make our machines a stellar value. Our machines always meet or exceed their rating, even under the harshest of conditions. Arctic-Temp machines are specifically designed for ease of maintenance and easy access to all components. We make use of double surface freezing on our concave evaporators for increased efficiency and quick ice production. We utilize standard components for which spare parts are readily available so you don’t have to buy from us if you don’t want to, once your warranty expires. Our freezing zone doesn’t have any moving parts, resulting in greater reliability and less maintenance. We don’t use complex electronic circuitry that is prone to failure, hard to diagnose, and expensive to repair. We utilize a mechanical control for the freezing operation and the harvest operation. Our industrial ice machines operate efficiently. Our machines re-circulate water, in order to minimize your water expenditure. Thoroughly vacuum and leak tested to guarantee that your machine is operating at its best, and able to meet or exceed the capacity it is rated at, before we ship it to you. Holiday Ice manufactures machines with top-quality parts and components, including highly acclaimed Copeland compressors. Our machines are built for high reliability and a long life. Subsequent to your purchase, you can be assured that we will always be available should you have any service needs.